In the last essay I dealt primarily with the mechanics of Afghan Hound forequarter action. I explained how the front pastern in the swing cycle collapses as it makes ground contact, and gathers up as the limb reaches the vertical state, then tucking the pastern up and out of the way of the on coming rear hind leg, allowing the back leg to pass directly under the front limb, This is termed "thru-stepping. Video Link 1 I also explained that most Afghans now side step (crabbing) and how this gait form is having a deleterious long term impact on the skeletal structure of those individuals, and their welfare, as they age. In this essay I want to discuss another and possibly more important aspect for correct Afghan Hound gait, being "Natural Head Carriage" Any breed can be taught to carry their heads in an artificial manner, many show dogs do. Afghan head carriage is derived from a totally different origin and purpose, head carriage is inherent and should not need to be held up by a lead. The first Afghan standard was written in Colonial India, modelled on Zardin, circa1906. Photographs of Zardin demonstrate his natural head carriage. Anglicised breed standards are all based on Zardin: all of which mention the characteristic "Proud Head Carriage". "head held proudly and a style of high order". "the head MUST be carried proudly". It was American author, breed enthusiast and owner, Connie Miller, who originally coined the term "reconnaissance trot", and provided a superior explanation of this unique characteristic and significant survival trait. She provided a plausible reason for what has evolved naturally, positing it as an " over the horizon surveillance" technique for spotting potential prey. Considerable emphasis needs to be placed on "Head Carriage". This unique and "Breed Hallmark" characteristic is intrinsically tied to the breed`s evolution, structure and demeanour, and is essential for the correct execution of the "Classic smooth, springy gait", another "Breed Hallmark"
Few if any, Breed Specialist Judges currently test for "natural head carriage". Sadly many judges accept the dictates of handlers/exhibitors. Many exhibits, are "strung up" to such an extent they take on the appearance of some breed where the front feet are no longer instrumental in the guidance of the gait. Ask these exhibitors to show on a true loose lead, and then observe the response. By loose, I define that the lead must be placed low on the neck or wither. This requires a mutual respect and trust, understanding and training, between the exhibitor and their charge. In stark contrast, many handlers locate a choker flush and tight under the chin, on the opposite side to the handler. (This is also termed the double choke effect) Any neck lead control is itself a contradiction in terms, for the King of dogs. After all this is the breed where its natural demeanour, attitude and proud head carriage is what sets the breed apart from all other canine species. Lead control is best explained by observing the action of the tail. The tail response is a straight forward matter when an exhibit is shown on a loose lead. What should be observed is the following: The tail should unfurl with each and every stride. This unfurling is a natural consequence of the (load) impact of the front limb as it makes contact with the ground, and as the forequarter assembly absorbs the load (shock) and transmits this impact along the torso and spine, finally terminating in the coccygeal (tail) vertebrae. This unfurling is absent when exhibits are strung up. In fact the exhibit which is strung up is denied the opportunity to correctly negotiate ground impact in a normal manner. This is particularly the case when exhibits are gaited inappropriatly fast, whereby the exhibit needs to over step, with the full load bearing joints absorbing the impact in an asymmetric (and oblique) manner. Dogs do not over step naturally, unless they are grossly unbalanced. When an Afghan gallops, its tail actually recoils at the full extension stage. In contrast, it unfurls in the trotting gait. The dogs whose tails fail this test, requires your critical appraisal. Take the time to observe the tail carriage of Afghans at some large events this will help develop a more considered critical appreciation of this important indicator for balanced locomotion. Correct head carriage is a "Primary Hallmark" of the breed. I propose that a maximium of 10% of Afghan exhibits still present natural head carriage. Many of today’s show/conformation Afghans have been sadly reduced to being presented like any other show dog. Is this truly what judges with a moral imperative really admire? What has happened to this breed over the last few decades? Digital technology allows us to compare exhibits of yesteryear with those of today. The elevation in popularity, and exponential rise in numbers during the nineteen sixties and seventies facilitated the breed`s burgeoning, gene pool, this giving rise to the full potential of the enormous genetic diversity within the breed. This explosion in numbers produced some amazing individuals. Natural Head carriage and the Flying Trot. Definition of the Flying trot : "An accelerated, four step trot where all feet are off ground momentarily". The breed's unusually large front feet may also provide a further function to the gait. These large, weighty feet and pasterns might be employed, not only in providing a broad footprint for traversing snow or sandy terrain, but also permits the dog to extend the reach stroke through momentum. As the weight of the forearm (ante brachium) is thrusted forward. This throwing forward anterior action can engender an impression of a floating gait. Now compare the unusually large feet and the refined skull with other Sight Hound breeds (another interesting "Hallmark" of the Afghan). How do we tell if an Afghan Hound has good movement? The human eye can discern movement at around one tenth of a second, or 100 milliseconds. The Afghan pastern lift generates the smooth springy impression, and takes around 5 milli-seconds to occurr. Consequently, this fine detail is only detectable and accurately measured with high speed video cameras. Visual Assessment for Correct Gait. Next, the front reach and rear drive should terminate their actions simultaneously, and should achieve a similar reach height. If the forequarter has fully extended and commences its return to the ground whilst the rear drive continues in the drive swing, the dogs gait is unbalanced. Some judges mistakenly refer to this imbalance as a powerful rear kick action. This accentuated pendulous action should be termed "Wind Kicking". This is wasteful and unbalanced gait, this results from a lack of inherent synchronicity and co ordination often seen when exhibits are being dragged along at velocities the exhibit is unable to achieve naturally. Furthermore the exhibit will be seen to be crabbing badly, the head will need to be held up. The tail will show the exhibit to be distressed. Judges whom reward such action lack the basics in Afghan locomotion. The topline ought to remain level whilst the exhibit is trotting, with the topline rising and falling smoothly and rhythmically, with each and every stride. This rise ultimately reaches its highest point midway during each reach stride. The topline is at its lowest position when either fore limb is in the vertical position. Another feature of head carriage is that the head remains relatively static through the trot cycle.The top of the muzzle is, ideally, horizontal. The neck can be carried from a 65 degree to a 90 degree angle from the ground. This depends largely on the demeanor, interaction and engagement of the Hound. I contend that an Afghan Hound that carries it's head high naturally, has a smooth springy gait, stands balanced and evenly on it's large fore and hind feet, confronts the world with its natural demeanor, is a sight of awe, the antithesis and envy of any other show breeds. The Afghan's very nature makes it the ultimate show dog. 2 : Ringed Tail, Low Tail Set and Flat Croup. 3 : Smooth Springy Gait. 4 : High or Proud Head Carriage. 5 : Unusually Large Feet / Refined Sculpted Skull/Punishing Jaw. 8 : Stamina and Endurance. 9 : Oriental Scented Hound. 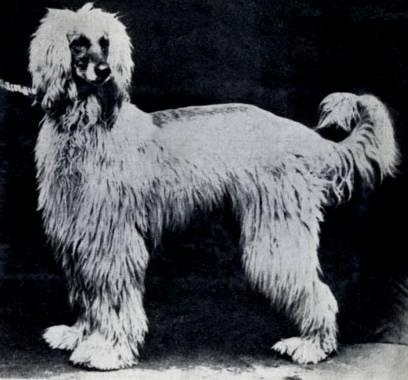 All purebred dogs are in a constant state of evolutionary flux However, no other breed has evolved as many different unique physical breed characteristics as the Afghan Hound. The World's fascination with the Afghan's continuously growing silky coat, has been well exploited and developed to where the coat is now a groomer`s delight. The evolutionary purpose of breed`s ringed tail is not understood and often difficult to breed predictively. The smooth springy gait is seldom appreciated as is the high head carriage which is so essential for correct Afghan gait. The Afghan's unusually large feet are seldom checked. Terrence R Wilcox Alaqadar Afghans Primary author and contact. Dr. Rebbecca S Wilcox BVSc. (Hons1) Bac.Sci. Alaqadar Afghans, editor. Copyright : Terrence R Wilcox 2009.